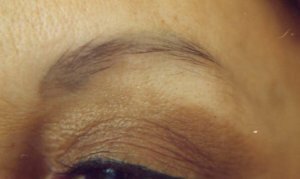 Let’s take some time to discuss permanent makeup for eyebrows. 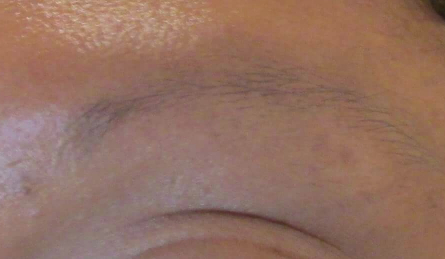 Have you over-tweezed, waxed, shaved or pulled your brows until they refuse to come back? [Also see Trichotillomania (hair picking)]. 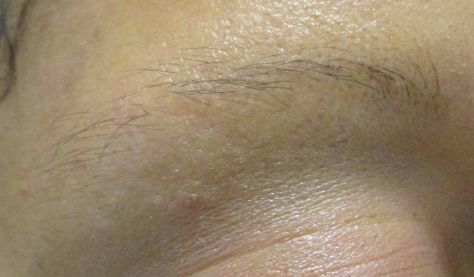 Are your brows sparse or non-existent due to heredity or alopecia areata (hair loss)? Had an accident and scarring hasn't allowed the hair to grow back? 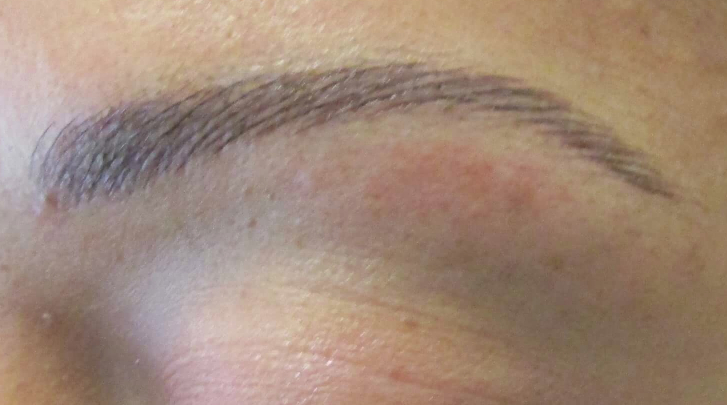 During your consultation I will draw in your brow so you can see what it will look like. I create a brow for your individual face. You don’t have to make a decision at that time. You can think about it if you like. Wear it for the day. Show it to a friend whose opinion you value. I want everyone to be comfortable with their decision. If you decide to go ahead with the work, I like to place a small sample of the color we choose, into the brow and let it heal for two weeks. We want to see what you bring back. The test is an important step. I could put the same color on ten people and they could all vary. The test is barely noticeable, so you can go about your daily life and put on your brow as usual. If you have no brow hair, you can still put on your brow and it will camouflage the test. The test will drop in color in about 7 to 10 days. After the test, we complete the work, then wait 6 weeks and there is a touch up appointment. The color will drop up to 50% in the first 7-10 days. You are healing for a full month, but you can’t see it. 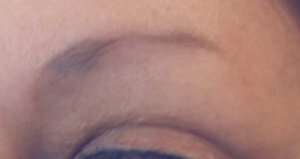 Because I leave space between the hair strokes the brow looks light and airy from the start, but will be darker than when it is healed. You can go about your life. Everyone’s skin tone is different and the color can vary from person to person. 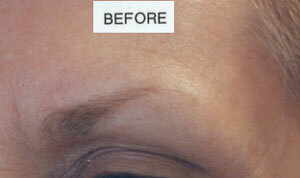 It is important to understand that permanent makeup will fade over time and can change color. Sun, body chemistry, products we use on our skin, medications you are on, the fact that the pigment is something foreign in the skin that the body is trying to rid itself of, are all factors in how your permanent makeup will be effected in the future. I want everyone to know this so you can make an informed decision. If there is the possibility that your brows will grow please see “When not to Tattoo”. You will be amazed at the possibilities. I am a big advocate of letting your brows grow. I have helped so many women regrow their brows. Not through anything magical, they just stopped over tweezing and over waxing. Please click on “When not to Tattoo”. I get you through the in-between stages by shaping the brow and then you have a shape to follow to fill in with powder or pencil, until the brows grow in more. This usually takes about 3-4 months. In some instances the brow may not come in completely. 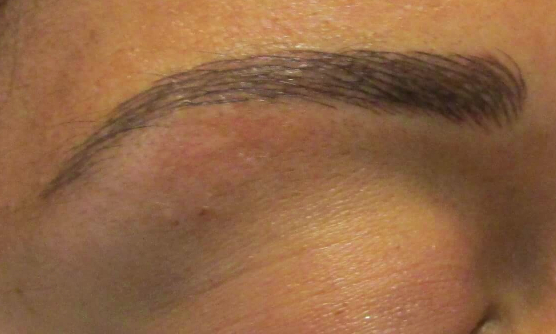 In this case you now have the option of just putting permanent makeup “only” where it is needed.There is nothing more wonderful than your own full, well shaped brow. Please click on “When not to Tattoo” on the left hand side of any page. This is right after the Microblading technique. The left brow is a little higher than the right because I wanted to use as much of her own hair as possible. In reality most people have their left brow higher than the right when they have their own brow hair. Take note when you look at people if you can see this difference. With this particular technique I have found that the middle browns and blondes generally need more followups than the very dark browns and almost blacks. These are very thin hair strokes and can be more temperamental. Not all brows should be big and too close or square. The fronts should be soft, not heavy and filled in. When this heals the color will be graduated from the front to the center to the tail. Old tattoo removed with wrong laser. 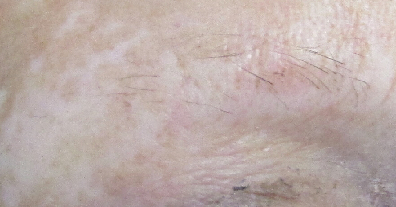 Tattoo removed with correct laser. Scarring from accident. Hair won't grow back. Client requested light shading for natural appearance. 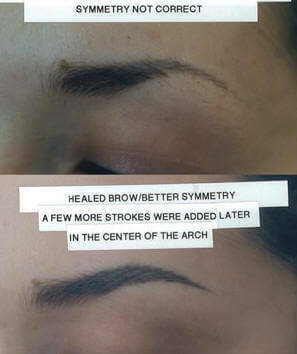 Brows previously tattooed by another tech. Much too thin. She has tried to let them grow, but not enough comes in to make a difference. 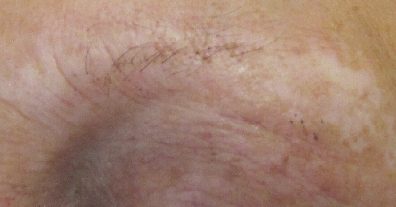 Brow right after procedure. The true result will be in about 3 months after the touch up appt. Some people hold onto the hair strokes, others not as well. We may also widen the brow just a bit after she is healed from this first appt.